This trip is available from Tuesdays to Sunday. Except 25 December and 1 January. Leave from Barcelona (Ronda Sant Pere, 21) on line 602 which connects Barcelona with Girona and Figueres. You can download the timetables in the download section of this tab. Girona-Figueres DayPass: unlimited 24 hour travel between Barcelona, Girona and Figueres in regular routes with travel card. The exchange of the DayPass can only be performed by the bus driver. Ticket for Dalí Theatre-Museum + Dalí Jewels Access (no queues). Entrance time is possible is possible from 12:00 p.m. to 3:00 p.m. You must show up 15 minutes before admission time. Regular transfers to Girona to visit the city at your pleasure (optional), with the Girona-Figueres DayPass. Regular return service to Barcelona with the Girona-Figueres DayPass. 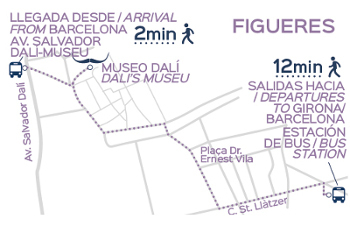 Departs from Barcelona (Estació del Nord) and arrives at Avinguda Salvador Dalí-Museu (Figueres). Return journey from Figueres (bus station) to Barcelona (Ronda Sant Pere, 21/23). Departs from Figueres (bus station) and arrives at Av. Ramon Folch (Girona). *Only runs from monday to friday working days. Return journey from Girona (Av. Ramon Folch) to Barcelona (Ronda Sant Pere, 21/23). Consult timetables for all lines on the route planner on our web page.